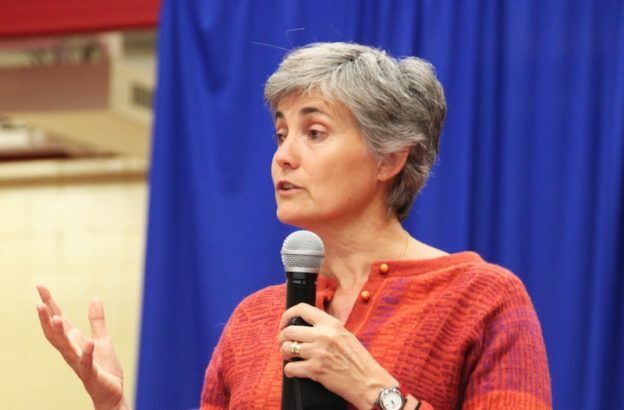 We are watching the economy change before our eyes, and Zipcar Cofounder Robin Chase has been at the forefront of that change. She gives her observations on the platform economy, automation, self-driving cars, and how a basic income could be what smoothes the transition as we move to a different type of relationship between people and their work. Jim: And I’m Jim Pugh. When people think about basic income, they often tie it to some future scenario where automation has drastically affected the way that the people work. But just thinking about how technology affects work is not something limited to the future — it’s actually something that exists today. Owen: I feel like automation and just the way that technology impacts employment and how people relate economically is something that comes on much more slowly than people tend to appreciate. And the self-driving cars may be a perfect example. We think of them as this kind of futuristic thing that’s going to be a whole new product that looks pretty unlike what we have today. However, we’ve got automatic transmission, cruise control, a lot of cars have lane-keeping right now where it automatically stays in your lane, self-parking. The same kind of thing happens with the economy where recently more and more we have shared resources, the collaborative economy, the sharing economy. These are slowly chipping away at the legacy structures that have existed for decades. Jim: There’s more and more companies out there that are adopting new approaches to the way that they employ people and the way that, really the conception of what a worker is. The people who are working in these companies really have a first-hand experience as to seeing what’s happening here and what impact it’s having on people’s lives and the economy at large. Owen: This week, we are very lucky to have someone who’s at the forefront of the new economy. Robin Chase is co-founder and former CEO of Zipcar and author of Peers Inc. Welcome, Robin. Robin: It’s a pleasure to be here. Jim: To start with, Robin, can you tell us a bit about what first got you interested in universal basic income? Robin: When I was writing this book Peers Inc, I was thinking a lot about, I would say, the platform economy. I was understanding from a trend basis and from economic basis that everything that can become a platform will become a platform. That the outsourcing of workers — and I say that in a kind of negative way — is incredibly economically compelling. That companies that think of themselves as platforms grow faster, they learn faster, they are hyper-adaptive and hyper-localized. They’re very hard to beat. So if your company can take that shape, you’re going to take that shape. We’re seeing it today. I was looking at something that was the top 50 innovative companies in the world. I would say 98% of them are what I would consider to be Peers Inc companies. Companies that are based on a platform with this satellite of assets that are outside of them. Once you understand that trend and internalize that trend, it says, “Whoa, oh my god.” We have completely structured our economy on the idea that people work full-time and get benefits full-time. The fact is, I don’t know if that was ever true, maybe it was true in 1940, but it is not the economy that we’re seeing today. Our social safety nets and workplace rules have been tied around this aging idea, outdated idea of what work looks like and that is not the future. I’ve realized we really need to have a universal basic income. I would say the other place that has taken me down this path is I do a lot of work on the future of self-driving cars. Unlike previous transitions, I expect this one to happen quite quickly because it’s economically compelling to make the transition from both the supply side, if you’re a supplier of transit services, and from the demand side, if you’re a consumer of transit services. It’s very compelling, economically compelling to make the switch. Which means we’re going to put a lot of drivers and their ecosystem out of work not in 60 years but in 5 to 10 years. Another reason why I am definitely supportive of doing pilots at a minimum around universal basic income because I see it’s something that we definitely are going to need to have. We need to have it today, and we’re going to need more of it, we are going to need it more profoundly in our future. Owen: The changing economy is something we talk a lot about here. How would you describe what it’s like to be a worker in the platform economy? Robin: If I think about, let’s just talk about the upsides first. I am 58, and when I got a job, my first job, my first job was boring as hell, and I hated it. My mom would say, “You can’t quit that job. You can’t quit that job for at least a year and a half because it’s giving you benefits. If you quit any earlier, you’re going to look like a shifty worker.” It took me years and many different jobs to figure out what it was that I was good at, what I loved to do. It was a kind of very slow iterative process sequential learning of what it was I was good at. One of the beauties of working on these platform economies is that I can do many things at the same time. There’s this nice sentence I got from someone else that said, “My father had one job in his lifetime, I’ll do six jobs in my lifetime, and my children will do six jobs at the same time.” Those six jobs at same time — and so maybe it’s going to four, who knows? But when I do that, I can have a passion job. I can have a job where I’m learning. I can have a job that’s my money job. I can have these different types of parts of my life where I’m exploring different things that I might like to do or that I’m interested in while I’m making some income. One of things that people really love about it is being in control of your time. Being flexible, having the flexibility. You are your own boss. Coming back to the contrast with the idea of full-time jobs as being the end-all: in a full-time job economy, you’re in a binary position. You’re either employed or unemployed. You either have income or you have no income. That choice about being employed or unemployed is out of your hands. It’s some boss that’s choosing to hire you or not hire you. In this platform, Peers Inc economy, I am able to choose my own, I can make money with my own initiative. I can work the number of hours, I can earn the amount of money I need. All that said, those are all the positives. So, positives: flexibility, figure out what you’re good at, having economic agency. Those are really positive things. On the flip side, it’s very precarious. It’s precarious while you figure out what you are good at. It’s precarious in that some of these things are– some of this work is seasonal. It’s precarious around health benefits and workplace rules. All of which now fall into the burden of the individual. If we were precarious before, when we work in this Peers Inc economy, this platform economy, we are more precarious than before. There’s both resilience and precarity built into this doing four jobs at the same time. That’s kind of how I see the upside and downsides. I just want to say one more thing about this: when we talk about the collaborative economy, of which we are finding and discussing many negative aspects, I want to say the fact that there are negative aspects doesn’t mean it’s not a great thing because I just explained lots of great things. If I go back to the foundation of industrialization, people worked seven days a week and we had child labor. We fixed those things. The fact that this new way of work has downsides, it does have downsides, and we have to correct and work on those downsides. Right now, we are seeing people increasingly having to work not in full-time jobs work at many things and we don’t have the– we haven’t corrected for the downsides that come with that way of work. Jim: On that note, how do you see basic income connecting here? How does it serve to deal with some of the issues that you just described? Robin: There’s that common– there’s that statistic that, I think it was Gallup that did, that was saying 40% of people couldn’t cover a $400 bill. I look at that and when you do sociological reading, you see that these outlier events are the things that take people into bankruptcy and take them into terrible jobs. I see universal basic income as being the minimum platform on which we can now arrange our life. It’s giving us a basic income security, and what is that number? I think about, one thing about universal basic income, I don’t know if it’s going to be $1,000 a month or if it’s going to be $400 a month. I don’t know. I know that at both of those points, it’s incredibly valuable to people. It takes away the precarity. Then I was interested at Mark Zuckerberg’s Harvard commencement speech and that he also pointed out this other upside which is rich, well-educated, privileged people have the opportunity to follow their passions and take risks. Poorly educated people who don’t have rich parents, spouses, cousins, and relatives to support them can’t take any risks pursuing any sort of interesting things. Basic income will enable them to do that. It seems, it’s not– it’s an equity piece, but I think it’s also an uncovering of innovation, improved quality of life, just a better– we’re getting more out of people. We’re getting more of the best out of people, rather than tying people to a go safe, don’t take risks type of work. Owen: You mentioned self-driving cars earlier. A very common response to the automation issue is that, “Well, we’ve had these concerns in the past, and new technology always brings about new opportunities.” How would you respond to that argument? Robin: That argument is extremely frustrating to me. That I look at it, and I say, and I think, you venture capitalist, you businessman sitting in your chair can say that. But the person who is in Bloomington, Indiana, who has a high school education, who’s 50 years old, who’s been driving a taxi for the last 30 years — that opening up of the new ideas of jobs, that is not going to help him. That is specific people with specific education and specific geographies. The idea that this is going to open up new jobs is, it’s a kind of rainbow fantasy dream. Sure, in the fullness of time over the entire economy, it could have new interesting things that happen, but starting Day One and Year One and Year Two for specific people and specific economies, we know profoundly that that is not the case. That we have people in cities that have lost their steel industry that are still terrifying. We have Detroit. If it were so straightforward, wouldn’t that have– we wouldn’t be seeing 30 years on the issues you have, the unemployment you have in Detroit. I think that’s a specious argument. Jim: There’s been a lot of discussion and germination of ideas around basic income in the last two years in the US. What do you see as the most exciting recent developments there? Robin: I have to tell you a funny story to tee up this. When I was writing Peers Inc and I got to this chapter about the fact and I saw, whoa, everything that can become a platform is going to become a platform. I’m seeing this huge push of work into these insecure part-time types of things. I thought, “You know what? What we really need is– people need an income that just comes in every month as a basic standard.” It was as if in my mind, I had come up with a really crazy idea that I invented. Kind of like my 11-year-old coming home and saying, “Mom, what if dogs pulled sleds? There could be something called dog sledding.” I thought, that’s been invented. I was very amused. If I think about the last two years, what really struck me is that this has become an increasingly mainstream conversation. What I thought two years ago, as a person who worked in tech, who works in innovation, who is very well-educated, I had never thought about it. I had never thought about it, never heard of it, never considered it, and now we see articles about it all the time. Not just on Medium, we see them in regular everyday newspapers, on televisions, and around the world. That’s been what’s been amazing to me over the last few years, is to see the increasing beat of discussion. Whenever I’m going toe-to-toe with someone on the idea of universal basic income, and they want to say, “We can’t afford it,” or “People are going to stay home, play video games, and smoke weed.” My answer to that is, “Maybe.” We have to do some pilots, because until we do some pilots, we’re just going to continue have this circular discussion about its impossibility and its impacts. That’s what’s been quite interesting to me is to see a larger– is start to see the rise of more and more pilots, so that we’re going to get more and more data, so we can put an end to this circular conversation that I think has been– is where we used to be, and we can start getting to a place of real data. Owen: You’re both the proponent and a builder of the collaborative economy. A great example of that is the company you co-founded, Zipcar, in which people, in which there are cars that anyone can access and take for the day or for the hour. Do you see the collaborative economy as a piece of the same puzzle along with the basic income, or are they more parallel to you? Robin: I see the collaborative economy as a restructuring of our current economy. That restructuring requires new rules, and that’s where UBI comes in. In the old industrial capitalism, you would build– the way you extracted the most value out of something was to put a very strong barrier around the company. You knew– and we would do that with patents and copyrights and certifications and trademarks. You knew very, very clearly who worked for the company and who didn’t work for the company. Who owned what assets and who the assets belong to. It was very clear, the ownership model. In this future economy, this currently blossoming and growing economy, this collaborative economy, it is very ill-defined and very fuzzy. Who owns these assets? Are you an employee, or are you not an employee? Who are you partnering with? What assets are you using? Is this a personal asset, a commercial asset? Is this — I’m looking outside my window — is this a residential district, or is it a commercial district? Who owns my data, who has access to my data? Whose access to my smartphones? All of this today is becoming very intertwined and multi-purposed. All of those old rules that went with that old economy no longer suit this new way of working and collaborating and sharing assets and ideas and data. UBI is a very nice underpinning to this new economy, to allow this fluidity of work, fluidity of ideas, fluidity of innovation to happen with all of– I just feel like, I feel a swirl, if you go deep into the idea of shared assets and data and space and time. If you want to get the most out of that multi-purposing and most of that potential, you need to have a nice, a firm economic standing that gives you the opportunity to take advantage of how you extract this new value, how you find new potential, how you share these assets in a fluid way. You need to have a kind of bedrock economic standing underneath that. Owen: That’s fantastic. My last question is, I’m just wondering if there’s anything you’d like to add on any of these topics. Robin: We haven’t talked about it a lot yet, but when I think about the automation of self-driving cars, if I had my dream future, which I’m working hard to help achieve in cities, all cars would be shared. Which would mean we’d only need 10% of them, which means 90% of the cars, let’s go to say 50% of cars we’re building today, we don’t need them to be built. We don’t need the resources to be dug up out of the ground, transported long distances, assembled in factories, transported to new places, housed and warehoused on streets. It completely– it takes this big piece of the economy out, in a way, and I see there’s a huge upside to that. That we can take back our cities and our curbs and our houses and parking lots, if we get this gigantic win from sharing cars and not having to store them. All of that, I want that transition to happen as quickly as possible because it has so many upsides. In order for that transition to happen as quickly as possible, we need to provide this support structure. I look at that, and I think that’s just one sector of the economy. I feel like our entire economy, from my perspective, a sustainability and equity perspective, is quite broken. I would like us to be able to evolve much more quickly without having the incredible anxiety over what’s happening to individuals within that economy. It’s another argument for me to have free universal basic income. If we don’t do that, two things unfold. One is, when we think about the automation of agriculture, we did that in a horrible way and a lot of people, millions and millions and millions of people worldwide, suffered through that 20-, 30-, 40-year transition. We should be doing much better today. I’d like us to do a much better job of that transition, and I’d like it to be much faster because of the incredible upside and the potential to unleash people best selves instead of their worst, “how can I get paid doing whatever it is required” self. I want us to do many more pilots on universal basic income. Ultimately, I want us to be a adopting it and paying for because I think it will unlock a dramatically better quality of life and dramatically more innovation than we see today. Owen: That was Robin Chase, co-founder and former CEO of Zipcar and author of Peers Inc. Thank you so much for joining us. Robin: You’re welcome. It’s my pleasure. Jim: You’ve been listening to the Basic Income Podcast. Thank you to our producer, Erick Davidson. If you like what you hear, please make sure to rate and review us on iTunes, Stitcher, or the podcast platform of your choice. Also make sure to share with your friends. We’re always looking for new listeners who’d like to hear more about universal basic income. Talk to you next week. This entry was posted in and tagged basic income, basic income podcast, platform economy, podcast, self-driving cars, ubi, ubi podcast on June 29, 2017 by owenpoindexter@gmail.com.